This small Nativity set of wire and beads is made by Patmore. The beads used in these figures are glass beads, which cost 5 times more than regular plastic beads. The set includes Joseph, sitting Mary holding baby Jesus, and African animals including an elephant, a hippo, a rhino, a water buffalo, and a zebra. The Joseph figure measures 6.25 inches tall. Patmore is one of the finest bead-and-wire artisans in Africa. 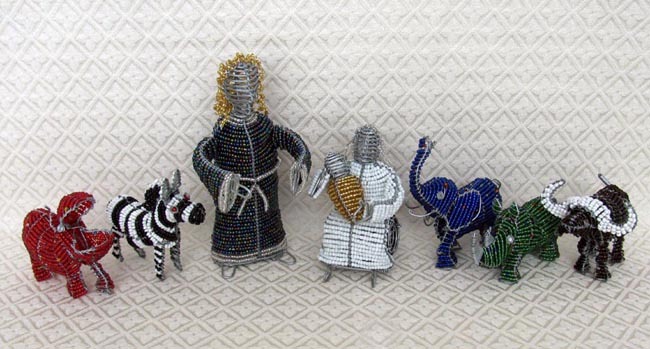 He was born in Chitungwiza, the very city in Zimbabwe where this type of wire and bead art originated in the early 1990s. He has been a refugee in South Africa since 2005, due to the terrible economic and political crisis in his homeland. His father passed away in 2002, which means that Patmore now is financially responsible for his entire immediate family—his mother, his aunt, his sister and her young child, and his youngest brother—all of whom live back in Zimbabwe. He aspires to one day return to Zimbabwe so that he may continue his studies and have a better life for himself and his family. Patmore specializes particularly in wire and bead Bentleys and other vintage cars, as well as detailed Harley-type motorcycles and animals like elephants, cattle, and birds (especially the toucan and the macaw). He began making Nativity sets only after we saw his intricate animals and asked if he would try Nativities.